On my last day in Hong Kong, I still had some items on my itinerary, and I fully intended to carry them out, despite the inclement weather. I rushed out of my hotel room first thing in the morning, but a few minutes later, gusts of rain and wind forced me indoors. Luckily, I happened upon the basement level of Mira Mall, which houses several Japanese labels, including Lowry Farm, Jeanassis, Global Work, a Japanese zaaka store, Niko and..,, and Wired Cafe. I bought a few tops for work at Global Work, and then leisurely browsed through Niko and… then stopped in for a coffee at Wired Cafe. At first I was stressed out that I wasn’t making the best use of my time, sitting in a cafe, instead of being on the go, but it turns out, my short time spent at this small corner of Mira Mall felt just the way a holiday is supposed to feel. 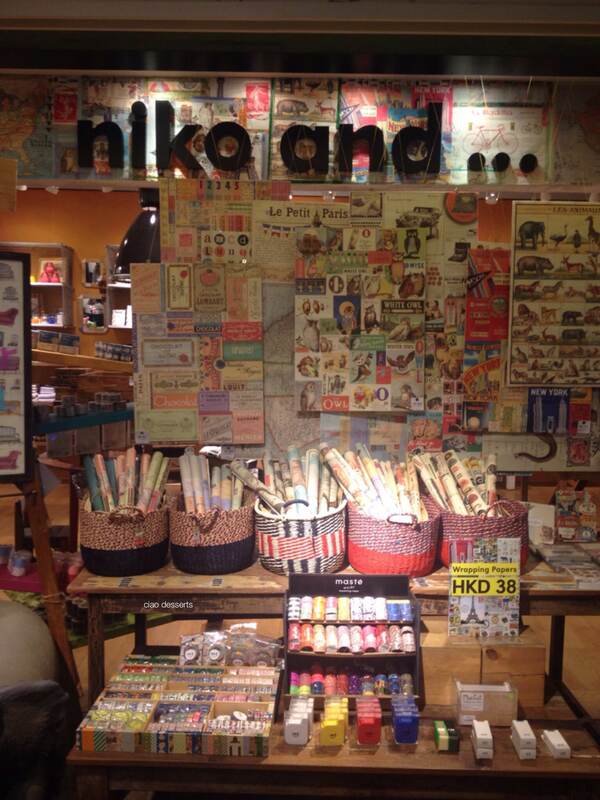 I browsed leisurely in Niko And…(Niko stands for: Nobody I Know Own Style) which sells a little bit of everything, from stationery, housewares, knickknacks and clothing and accessories. I really enjoyed the ways they displayed their merchandise. Rolls of washi tape are placed under sheets of wrapping paper, which are hung from the ceiling using colorful strings. Glasses and mugs in all sorts of shapes and sizes are also displayed on wooden shelves. If I hadn’t already had a suitcase full of kitchenware from both Shanghai Street and Pantry Magic, I would have had a harder time resisting these lovely ones here. 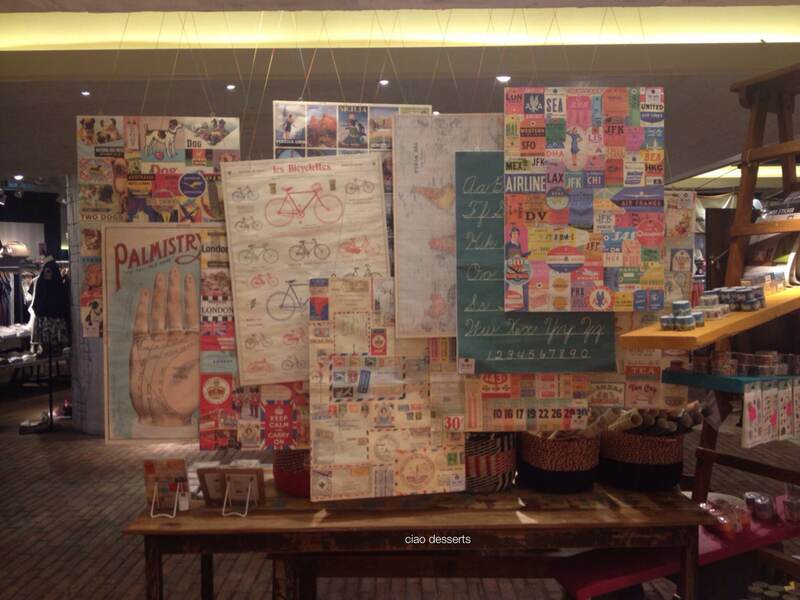 One merchandise display that I really found to be inspiring was a wall covered in pretty wrapping paper. The wall also had several postcards on display. However, instead of using the usual wire racks, the post cards are individually hung by a tiny piece of MT tape, hooked onto a nail. It’s such a simple idea of folding a piece of MT tape in half, and punching in a hole, but so creative and useful at the same time! I can totally use this idea in my own living space! Usually when I’m out and about in my daily life, I don’t really have the time to notice such tiny details. But it’s such a treat when I do discover something like this. Next, I stopped into Wire Cafe, for a cup of coffee. I liked the open plan of this cafe. Most importantly, there is quite generous spacing between the tables. Space is such a rare luxury in Hong Kong. The decor of Wired Cafe is dominated by a sunny yellow wall, (which kind of reminds me of cinderblocks) and cheerfully colored mismatched furniture. It was about lunchtime, and several people dropped in for a quick cup of coffee and a bite to eat. There are also several magazines available for browsing. I was happy to discover a recent issue of Monocle, which I leisurely read from cover to cover, during my stay. As I remember from my Home Ec classes of yesteryear, Dutch babies are oven baked pancakes, made from eggs, sugar, butter and milk. They are usually also served with a generous layer of powdered sugar. Since there was already both butter and sugar in the pancake, I just added a squeeze of lemon on top of mine. The pancake was fluffy, buttery and all together delicious. Perfect for soothing frazzled nerves. As I look back on my three days in Hong Kong, I realized that I really had a wonderful time. I had the chance to spend a lot of time indulging in a favorite past time, see new sights, and laugh with my friends. A lot of people mentioned that they don’t see Hong Kong as a particularly relaxing travel destination, and I agree that it is easy to be overwhelmed in this city full of noise, people, traffic and buildings. But I also found that it is just as easy to find a corner, that captivates my interest, and is absorbing enough for me to accept about all the background noise. I look forward to many more trips in the near future! Information: Mira Mall | 118 Nathan Road, Tsim Sha Tsui, Kowloon, Hong Kong.